Charleston, TN — After finishing first in the regular season the Rhea Middle School softball team had to settle for a second place in the SETAC post season tournament as Cleveland came away with the 9-7 win in the championship game played at Walker Valley High School. In their opening game of the tournament they took an early 3-0 lead and ran lead up to 9-0 in the bottom of the 4th inning. 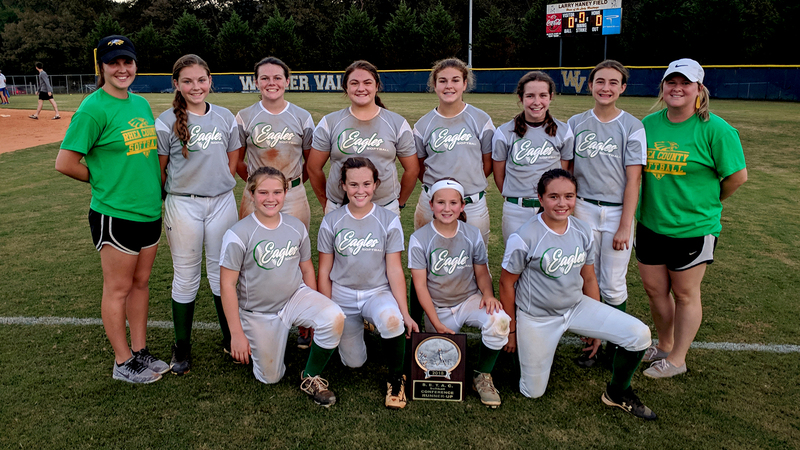 Ocoee Middle put up 4 runs in the fifth and four more in the seventh before Rhea Middle salvaged the 9-8 win. Emily McDonald and Gabi Messer each had four hits in the game. Lainey Fitzgerald and Ally Shaver combined for the win on the mound. McDonald also had four runs batted in for the game. Regular season champs of SETAC for 2018. Rhea Middle won the regular season championship in SETAC with their 7-6 win at home. In the game it was Lady Eagles putting up 3-1 lead and then Lake Forest responding with five runs to take 6-3 lead in the top of fourth. 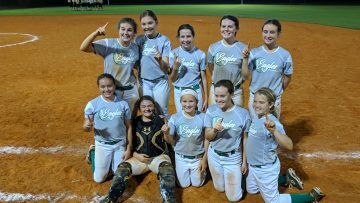 Rhea Middle came back with two runs in the fifth and then two more in the bottom of the fifth for the walk off 7-6 win. On the year the Lady Eagles won 7 games while losing 3. For first year coach Myranda Hamby and assistant coach Whitney Thompson, this was a very satisfying year. 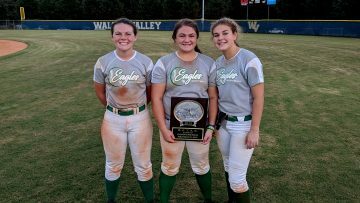 Eight Graders left to right: Emily McDonald, Bialey Roberts and Gabi Messer. Gabi Messer – We are so proud of Gabi and all of her leadership she showed at the plate this year. She had several clutch hits that tied our games or put us up a couple of runs. She was also a solid first baseman for her infield. Her clumsiness and laughter will be missed in the dugout next year. Bailey Roberts – Bailey showed great leadership behind the plate and hitting this year. She stepped up and filled the roll of catcher and grew so much defensively. She was our cleanup hitter and produced hits at the most needed times. We will miss her contagious laugh and enthusiasm! Emily McDonald – We are so fortunate to have had Emily with us this year. She moved here from Georgia during the summer and stepped right in at third base. She is a versatile player and can hit the ball hard. She brought much confidence to the plate and was one of the hardest outs to get in our district. We will miss her competitive spirit! !